President Obama made a meaningless gesture in freezing the pay of federal workers. He talks about making sacrifices but manages to forget that government workers already make less than people in the private sector for comparable jobs. He again falls into the trap of justifying a Republican talking point by doing the very thing people who despise him have been pushing. And, economically, he isn’t addressing the economic crisis with this move, since, as the New York Times says: the $5 billion to be saved over two years will barely dent a deficit that has exceeded $1 trillion for the past two years. And even those savings would be swamped by the multitrillion-dollar costs of the bigger issue dividing Mr. Obama and the Republicans — what parts of the Bush-era tax cuts to extend beyond their Dec. 31 expiration, and for how long. This is another example of the administration’s tendency to bargain with itself rather than Republicans, and in the process reinforces conservative myths, in this case the myth that federal workers are overpaid. Such a policy also ignores the fact that deficit reduction and loss of pay at a time when the unemployment rate remains above 9% will only weaken a too-weak recovery. Obama’s tendency to compromise with Republicans without getting anything in return is getting tiresome. And with each failure in resolve, he ensures the rich get richer and the poor get poorer. Yep, that’s exactly what we needed: a transparently cynical policy gesture, trivial in scale but misguided in direction, and in effect conceding that your bitter political opponents have the right idea. We are overdue for a backbone transplant. Hatsune Miku is a pop princess in Japan. Singing and dancing across the stage with head-to-calf length blue-green hair, she has sold out concerts in Japan and Singapore. She’s 16 years old, is about 5 foot 1, and weighs 92 pounds. And she isn’t real: She’s a hologram. Miku is a singing, digital avatar created by Crypton Future Media that customers can purchase and then program to perform any song on a computer. Crypton uses voices recorded by actors and runs them through Yamaha Corp.’s Vocaloid software -– marketed as “a singer in a box.” The result: A synthesized songstress that sounds far better than you ever have in your shower. Rei Toei is the beautiful, entirely virtual media star adored by all Japan. Her black hair, rough-cut and shining, brushed pale shoulders as she turned her head. She had no eyebrows, and both her lids and lashes seemed to have been dusted with something white, leaving her dark pupils in stark contrast. Gibson has an amazing understanding of the way things are going to be in terms of technology. At first, I found it hard to understand the concept of the Internet. Then I read his first book, “Neuromancer,” and everything made sense. If Hatsune Miku follows the trajectory of Rei Toei, she will eventually marry a real-life rock star, a literal merger of virtual and reality. These jaunts into the virtual world raise the question of if we’ll ever get to the stage where artificial intelligence takes global control. Some say we’re already there (If computers go down, we are lost). But for now, we’ll just take a look at the latest singing sensation. The Japanese have created a new style of performer. The best fake performer we’ve been able to do is Milli Vanilli. Leslie Nielsen died Sunday in Fort Lauderdale at the age of 84. He had a two-phase acting career, which began as dramatic lead in the 1950s and lasted until the 1980s when he surprised everyone with his comedic timing. He had an extensive television career and was a pioneer in dramatic television, with his first role in the “Studio One in Hollywood” series in 1949. The SF effects in the above clip are outdated, but they were cutting edge back in the 1950s, supplied by an animator loaned to MGM by Disney. After a long career of leading man roles, Nielsen signed up for a 1980 low-budget disaster-movie spoof called “Airplane,” where he played an extremely odd version of his normally straight-laced persona. Most obituaries will point to his role as Frank Drebbin in the “Police Squad” and “Naked Gun” police-procedural series, but if it weren’t for “Airplane” we might never have known how funny Leslie Nielsen could be (though the pretend freeze-frame closing credits of Police Squad were the best part of the show). “I don’t want to concede that we have to get used to this kind of thing, because I don’t think the majority of Americans want to put up with the blue-bloods — and I want to say it will all due respect because I love the Bushes — the blue-bloods who want to pick and choose their winners instead of allowing competition,” Palin said. I’m not the brightest bulb in the chandelier, but if I was a bumbling incompetent running for president, I would try to charm people who have shown they can get a bumbling incompetent elected commander in chief … twice. How is it that Europeans can put together a demonstration that focuses on one specific issue and doesn’t get distracted by fringe causes, while American rallies suffer from ADD, with people running around in ridiculous costumes protesting everything and accomplishing nothing? This question is brought on by yesterday’s demonstrations in Ireland, where at least 50,000 people protested the International Monetary Fund/European Union bailout package that will lead to a cut in social services and cost the average middle class Irish family $5,800 a year. The mostly peaceful and restrained nature of the protests on Saturday was one indication that the unrest may not lead to confrontations in the streets, as some have feared. On a bitterly cold day, organizers put the turnout at 100,000. The police estimated 50,000, still one of the largest protest gatherings in years. Organizers had called for a “family friendly” demonstration, and the occasion passed with few incidents, apart from isolated scuffles between demonstrators and the police. With a police helicopter hovering overhead, speeches at the post office building drew cheers and shouts of support, and the detonation of some fireworks. The restrained mood was enhanced by musical groups that performed along the way, including a kilted pipe band from the country’s prison service. Protesters waved banners that depicted the austerity measures as an attack on the country’s sovereignty by the international financial institutions drawing up the rescue package, and on the poor. In Ireland, they protest because an economic crisis created by bankers is hurting the social safety net. In America, we protest the social safety net because of an economic crisis created by bankers. As the above video clip shows, the demonstrators are rational. No crazy rants equating Nazis, Socialists and Communists. No foaming at the mouth by the equivalent of Medicare recipients who want the government to stop social-welfare programs. Signs get directly to the point. No one dressed in period costume. We could learn something here. Sarah Palin has a lot of critics in the U.S., but what do people on the other side of the planet think about her. Next Media in Taiwan (the folks who brought us the animated Tiger Woods video) has this take on her. (Courtesy of Crooks and Liars). Who would have expected a machine-gun toting, seal-clubbing maniac? 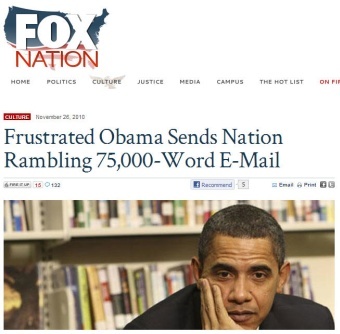 Now, what Fox Nation didn’t originally explain was that the source of the item was The Onion, which anyone with half a brain knows is a satirical Web site, which one should take as seriously as the National Lampoon or Mad Magazine. Of course, readers who make up the Fox populi didn’t use that half of their shared brain and started going on a tirade in the comments thread about how Obama had lost his mind and was a threat to national security, comments that luckily were preserved by Raw Story.